A "plan and profile" of Nevesbu's Project 1047; it is not specified if this depicts the final design. 236 m (774 ft) p.p. Notes: all of the above characteristics are from a drawing dated 19 April 1940, with the exception of the armament; those are from a drawing done on 16 February 1940. After a recommendation from high-ranking Dutch naval officers that the Koninklijke Marine (Royal Netherlands Navy) be bolstered so any attacker would have to deploy a significant amount of their fleet to the East Indies, keeping it from other theaters of war, the Minister of Defense ordered the Navy to prepare designs for a two or three-member class of battlecruisers. As they had not previously designed a modern capital ship, and the only information available on modern designs came from public literature and editions of Jane's Fighting Ships, the Dutch turned to Germany. This initially bore no results, as the two sides were unable to come to terms. During this time, a preliminary plan was drawn up without foreign assistance; completed on 11 July 1939, it was missing many of the post-First World War advances in warship technology. In particular, the armor protection was completely outmoded. 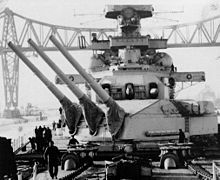 Germany and the Netherlands were eventually able to reach an agreement where Germany would release plans and drawings based upon their ideas for a battlecruiser, in return for a guarantee that all needed equipment would be ordered from German firms. With their assistance (mainly through NV Ingenieurskantoor voor Scheepsbouw), a rough design was formulated by February 1940. A visit to Italy prompted a rethink of the internal layout, which led to a set of drawings dated 19 April 1940. This is the last known design produced prior to Germany's invasion and occupation of the Netherlands. Final plans for the ships were never completed, and the ships were never constructed. The Koninklijke Marine had only one seagoing armored ship stationed in the East Indies, the coastal-defense ship HNLMS Soerabaja (ex-De Zeven Provinciën). As this ship was considered to be "of little remaining combat value", three light cruisers (Java, Sumatra and De Ruyter), a few destroyers, and a large submarine fleet were charged with the main naval defense of the islands. These factors forced the Koninklijke Marine to bolster this force, and so the construction of three "super cruisers" capable of overpowering cruisers of the Imperial Japanese Navy was contemplated. The Washington Naval Treaty and London Naval Treaty limited new cruisers of their signatory nations to not more than a 10,000-ton displacement and 8-inch (20 cm) guns, but as a relatively minor naval power the Netherlands had not been party to the treaties and was not bound by their restrictions. According to Dutch naval intelligence, the Japanese cruisers did not participate in exercises with the main fleet of battleships and fleet carriers, instead operating with seaplane carriers, so it was assumed that the battlecruisers would not have to face overwhelming carrier-based air strikes. Moreover, the presence of these powerful ships—whose larger guns could easily out-range any escorting cruisers or destroyers—would give the Dutch a fleet in being in the East Indies that could delay or end plans for an amphibious assault for fear that the invasion would be disrupted or the attacking fleet destroyed. Java moored at Den Helder in 1925. The main defense of the East Indies was entrusted to this ship and her fellow cruisers from the 1920s to the Second World War. In 1938, a number of high-ranking naval officers within the Koninklijke Marine gathered to discuss possible improvements to the navy. They concluded that the Dutch should have a navy strong enough to force an enemy to "use such a large part of his military potential that there would be an unacceptable weakening of his capabilities in other theaters". At this, and a note from the Chief of Naval Staff, the Minister of Defence J.C.C. van Dijk ordered the navy on 18 February 1939 to begin planning and estimating costs for two or possibly three battlecruisers. With no prior experience in building such large ships—as 1913 plans for 24,650-ton dreadnoughts were never brought to fruition due to the First World War[A 8]—and no significant source of information on more modern vessels—the only material available being unclassified sources such as Jane's Fighting Ships—the Dutch turned to foreign sources for technical assistance. As the Dutch lacked the design experience necessary to produce a modern warship, they hoped that the French would release plans of the Dunkerque class (pictured) to them. Although they hoped that the French would release plans for their Dunkerque class of 'fast battleships', they decided to focus their effort on Hitler's Germany. Informal talks had already been held in Berlin on 24–25 April 1939 where the Dutch proposed that, in return for the complete plans for the Scharnhorst-class battleship, they would order all of the necessary equipment for their construction program from Germany. A draft design was completed without foreign assistance by the Construction Department on 11 July 1939,[A 9] but it did not reflect the numerous technical developments that had entered capital ship designs after the First World War. In particular, its armor scheme was utterly obsolete, as it lacked any substantial amount of deck armor or good underwater protection; it came closer to the designs of 20 to 25 years previous than to that of a modern warship. Despite German interest in the battlecruiser project, the two sides could not agree on terms. The German delegation insisted that orders placed in their country be guaranteed, with financial compensation to be paid to German companies if the Dutch did not construct the ships. They also refused to release a complete set of plans for the Scharnhorsts. Further complicating negotiations, the Dutch Cabinet, which would have to approve any deal, did not convene during the summer of 1939. While awaiting official approval, Dutch planning went ahead. A contract with Ferrostaal A.G. Essen was drawn up, and on 15 May 1939 a list of products for purchase in Germany was submitted. [A 10] Two months later, talks were held in Bremen and Berlin (on 13 and 31 July, respectively) in which the Germans agreed to release plans and drawings that, although not specifically of the Scharnhorst-class, would reveal their ideas on battlecruiser design. Delivered on 21 August of that year, these showed various modern protection schemes that could be used in the new battlecruisers. On 4 October 1939, a German admiral previously appointed as a liaison between the two navies asserted that while Germany could not guarantee punctual delivery dates, it could assure the Netherlands that it would pressure the companies to meet the contractual dates and that the Kriegsmarine would not interfere with orders from the same companies. A month later, Ferrostaal A.G. Essen was formally appointed as the Dutch proxy in most of their dealings with Germany; this appointment did not include Germaniawerft. The design of the 1047s was based on the German Scharnhorst class; this three-view drawing depicts Scharnhorst in December 1943. Work on armament for the new designs was contracted to Germaniawerft; the Dutch met with the company on 31 July 1939 and supplied the characteristics for the main and secondary armament. Turret armor, main armament depression and elevation (10–45°, obtained through the use of hydraulics), and the muzzle velocity for the guns (850–900 m/s (2,800–3,000 ft/s)) were all specified. Requirements for the secondary armament included a maximum depression of 10°, a maximum elevation of 80°, and approximate armor values for their mounts (80 mm front, 150 mm roof, 50 mm sides). The fire control arrangement was discussed on 6 November 1939 with the Dutch company NV Hazemeyer Signaal Apparatenfabriek. By this time the propulsion plant, which was to be built in the Netherlands, was taking shape. Requirements sent out in August 1939 mandated that the ships have eight boiler rooms, four sets of geared turbines, and 180,000 shp. After further improvements, Nevesbu and two German firms (Germaniawerft was responsible for the turbines and Deschimag for the boilers) began sketching preliminary plans. These were then incorporated into two different design studies, one by Nevesbu and the other by NV Ingenieurskantoor voor Scheepsbouw (IvS). IvS was purportedly a Dutch company linking Dutch and German designers, but in reality functioned as a front company for German interests. Their design was probably based upon a set of plans drawn up by the Ship Construction Office of the German Navy and received in the Netherlands on 31 August. It did not give the propulsion machinery enough space, and it was thought that this design did not provide enough room for magazines. Nevertheless, it was taken into discussions with the Dutch, where the 11 July design was merged with it. IvS came out with one further plan on 11 March 1940, the merits of which were discussed with the Dutch in April of that year. In December 1939 the two studies produced their design proposals; both were capable of 180,000 shp and both had similar boiler capabilities, but the Dutch design was 199 m2 (2,140 sq ft) larger than the German. [A 11] Although it had the advantage of smaller size, the Dutch were concerned that the German design's power plant might not be capable of operating without problems (the Kriegsmarine did indeed face plant problems during the war). However, questions about reliability soon became moot; it was originally believed that around 84 m (276 ft) of the ship's length would be required for its propulsion plant, but it was discovered that no more than 72.8 m (239 ft) could be spared if the ship's ammunition was to be behind armor—and the German design needed 74 m (243 ft), while the Dutch design needed 78 m (256 ft). December also saw real doubts start to creep over the project, as a new Navy Minister had been appointed, and he believed that the Dutch would be better off acquiring a modern version of the old armored cruiser type. Basic characteristics were drawn up for a 29 kn (33 mph; 54 km/h), 16,000 long tons (16,257 t; 17,920 short tons) standard ship that had nine 24 cm (9.4 in) guns, a 175 mm (6.9 in) belt and a 75 mm (3.0 in) deck. Even though these vessels would have been superior to any 20 cm (8 in)-gunned, 10,000 long tons (10,000 t; 11,000 short tons) treaty cruiser, it was felt that too many compromises would be necessary. The belt and deck armor were judged inadequate, but to achieve the same protection as the battlecruiser design would mean no armament could be fitted. The smaller design also did not feature the speed advantage over opponents that the battlecruisers had. For these reasons the Navy "strongly recommended against the construction of such a ship", and the proposal was abandoned. The plan for three battlecruisers was authorized in February 1940; they, along with two light cruisers of the Eendracht class, would be responsible for the main sea defense of the East Indies. The new light cruisers would replace the older Java class, which would then assume the role of gunnery training ships from grossly obsolete ships such as the protected cruiser De Gelderland, which had been laid down more than forty years prior on 28 September 1898. The authorization of large battlecruisers meant that a new 40,000-ton floating dock would be built and many improvements to their planned base in the East Indies, the naval yard in Soerabaya, would begin. To handle the construction of such a ship, a new 250 m (820 ft) building way was begun by the Netherlands Construction Company, Ltd..
Germany's refusal to give the Dutch access to plans detailing the design of the Scharnhorsts below the waterline was a major problem. Inexperienced in designing an underwater protection scheme for a ship of this size, the Dutch were forced to turn to Italy for assistance, which allowed a delegation of engineers and naval officers to enter the country in February 1940. Although the Dutch delegation was barred from viewing technical drawings or the battleship Roma, then under construction, possibly to ensure that the details of their Littorio class battleship#Pugliese torpedo defense systemPugliese system remained a secret, they were allowed to visit Vittorio Veneto, toured several shipyards, interviewed the Chief Constructor of the Italian Navy, and received additional information on the Scharnhorsts, the Italians—Germany's ally—knowing some details of the ships. Although the issues the Dutch designers were having with a propulsion system were discussed, the delegation came away from Italy entirely uninspired by the Italians' efforts in that area. On the other hand, the visit provoked a drastic reworking of the internal subdivision of the proposed battlecruisers. The designers got rid of the previously required central longitudinal bulkhead and attempted to raise the double bottom to provide greater protection against magnetic torpedoes. However, due to the requirement for a shallow draft, this modification had to be abandoned. When another delegation was sent to Germany to discuss the problems with the battlecruisers, the Dutch took their evolving design with them. Dated 19 April 1940, this was the final version prior to the invasion of the Netherlands by Germany; Design 1047 was never fully completed. The normal load displacement was now planned to be around 28,482 tonnes (28,032 long tons). Although the propulsion was not yet finalized, the requirements had been re-examined in March 1940 to ascertain if 160,000 shp would be enough, taking into account that a plant that would produce 180,000 shp in tropical water would in northern regions produce ca. 200,000 shp—warmer waters adversely affect a steam turbine's efficiency. The updated requirements also called for eight Yarrow boilers fitted in four boiler rooms, and four Parsons geared turbines in two engine rooms, to drive four propellers at either 40,000 or 45,000 shp each (40,000 in tropic water conditions, 45,000 in North Sea conditions). Length requirements for the machinery had also been altered, once in early March and again on 20 April 1940; a total length of 79.5 meters was now called for. The main guns of Scharnhorst. The turrets and guns of the 1047s would have closely resembled these. The table of characteristics provided by Lt. Jurrien S. Noot for the 19 April 1940 design does not give any armament specifics, as these likely remained unaltered from the earlier 16 February 1940 drawing. This drawing provided the following: a main armament of nine 283 mm guns,[A 1] a secondary armament of twelve 120 mm dual purpose guns, and an anti-aircraft defense consisting of fourteen Bofors 40 mm guns and eight Oerlikon 20 mm cannons. Work on the main armament was contracted to Germaniawerft, which based its designs for the turrets, mountings, and guns of the 1047s on the 28 cm SK C/34 used on the Scharnhorst class. With a 315 kg (694 lb) APC shell, the guns would have had a muzzle velocity of 900 m/s (2,950 ft/s) and a maximum range of 42,600 meters (46,600 yards); 120 rounds of ammunition would have been stowed for each gun, and the rate of fire would have been about 2.5 rounds per minute. The guns would have been able to be elevated to a maximum angle of 45° and trained to 150°, while the loading angle would have been about 2°. Secondary armament was planned to be twelve Bofors 120 mm (4.7 in) guns in dual mounts. It is unclear whether or not these were intended to be an older version of the gun (which had been mounted as the main armament on Dutch destroyers since the 1920s) or an entirely new version, which in reality was developed in the 1940s during the chaos of the Second World War and were unavailable for warships until after the war's end. Detailed specifics such as range or rate of fire are also unknown; had the older gun been used it would in any case have been updated (including the use of dual instead of single half-shield mounts), and the more modern version did not see service until 1950, by which time it incorporated improvements from lessons learned during the war. 40 mm guns seen on the after superstructure of De Ruyter in 1939. It was planned that the 1047s would carry 14 of these weapons in dual mounts. Close-in anti-aircraft defense would have been provided by 40 mm and 20 mm guns. Arguably the best light anti-aircraft gun of the Second World War, the 40 mm Bofors was used for air defense both on land and at sea by many of the countries involved, including the Americans, British, Dutch, Japanese, and Swedish. Produced in the early 1930s, it first entered service with the Royal Netherlands Navy when the cruisers Java and Sumatra were refitted in 1934–35. Before the Second World War, Hazemeyer, a Dutch subsidiary of the German company Siemens & Halske, had devised "a very advanced triaxial mounting together with a tachymetric control system" for the 40 mm gun. When the Netherlands fell in 1940, this was brought to the U.K. aboard the minesweeper Willem van der Zaan, where it was copied and put into service as the British Mark IV twin mount. The description of the proposed fire control mechanism for the 1047s, discussed on 6 November 1939, mentions that the 40 mm weapons were "to be controlled autonomously from the gun positions"; this seems to describe Hazemeyer's system, but no direct link is made in sources. The Dutch Navy had already acquired a quantity of the Hispano Suiza 20mm guns before the war for mounting in torpedo boats and other craft and 6 of these were mounted in the cruiser Jacob van Heemskerck when she made her escape to Britain in 1940. The Hispano fired similar 20 × 110 ammunition to the Oerlikon but had a higher rate of fire and slightly higher muzzle velocity. The Hispano Suiza however was to prove insufficiently durable for shipboard use and would find its niche as a highly successful aircraft gun. Despite their superficially similar appearance, there were many differences between the Scharnhorst class and the final incarnation of the Dutch design. The 1047 was inferior in its armor protection, but in other respects was far superior: the main guns could be elevated 5° higher, the anti-torpedo system was thicker, the deck protection better accommodated the ship boilers, and the design did not make use of the problematic German power plant. In addition, the 1047s' anti-aircraft armament was far superior to the Scharnhorst class. The use of twelve 120 mm (4.7 in) dual purpose guns—able to function in both anti-surface and anti-aircraft roles—as opposed to the German division between 150 mm (5.9 in) anti-surface guns and 105 mm (4.1 in) anti-aircraft guns, was a more effective solution, as it saved needed space and weight on the ships in addition to simplifying logistics by requiring just one size of secondary ammunition. Twice in its history did the Netherlands navy plan the construction of capital ships. In both cases this occurred immediately prior to the outbreak of world wars. With the outbreak of the Second World War, almost all design work was halted, although work on turrets and gunnery arrangements by Germaniawerft's designers continued until the German invasion of the Netherlands in May. The first 1047-class ship was scheduled to be completed in 1944, so would in any case have been too late to stop the Japanese advance into the Dutch East Indies. Due to the war, final plans for the ships were never completed, and the ships were never constructed. ^ a b Although the guns are given as 28 cm (280 mm) in most texts, all 28 cm German guns had an actual bore diameter of 28.3 cm, or 283 mm. See DeGuilian on Navweaps.com. ^ In addition, the caliber length of the guns is disputed; three sources give three different caliber numbers. Gardiner and Chesneau (1980), p. 388 says 45 caliber, Worth (2002), p. 217 says 50 caliber, and DeGuilian on Navweaps.com gives 54.5 caliber. ^ a b c Noot (1980), p. 270 puts a question mark after this number. ^ The statistics given are for 1935. The top five oil exporters in this year were, in order, the United States, with 6,958 kt, Persia (Iran), with 6,860 kt, Romania, with 6,221 kt, the Dutch East Indies, with 5,139 kt, and the Soviet Union, with 3,369 kt. See: The Way to Pearl Harbor: US vs Japan Archived 2009-02-06 at the Wayback Machine, accessed 27 February 2009. Full citation given below. ^ a b c d e DiGiulian, Tony (9 October 2006). "Netherlands 28 cm/54.5 (11")". Navweaps.com. Retrieved 17 February 2009. ^ a b Arima, Yuichi (December 2003). "The Way to Pearl Harbor: US vs Japan". ICE Case Studies Number 118. American University. Archived from the original on 6 February 2009. Retrieved 27 February 2009. ^ a b c d e Bennighof, Mike (November 2005). "Dutch Battlecruisers". Avalanche Press. Retrieved 17 February 2009. ^ "The London Naval Conference, 1930". Timeline of U.S. Diplomatic History. U.S. State Department, Bureau of Public Affairs: Office of the Historian. Retrieved 17 February 2009. ^ DiGiulian, Tony (21 May 2006). "Netherlands 12 cm/50 (4.7") W-F Marks 4, 5, 6 and 7". Navweaps.com. Retrieved 27 March 2009. ^ DiGiulian, Tony (14 October 2007). "Sweden 12 cm/50 (4.7") Model 1950". Navweaps.com. Retrieved 27 March 2009. ^ a b c DiGiulian, Tony (31 August 2008). "40 mm/56 Bofors". Navweaps.com. Retrieved 28 March 2009. ^ "20 mm Hispano Suiza". netherlandsnavy.nl. Retrieved 2010-12-29. ^ DiGiulian, Tony (13 October 2006). "German 28 cm/54.5 (11") SK C/34". Navweaps.com. Retrieved 27 February 2009. ^ DiGiulian, Tony (20 November 2008). "15 cm/55 (5.9") SK C/28". Navweaps.com. Retrieved 25 February 2009. Breyer, Siegfried (1973). Battleships and Battle Cruisers, 1905–1970. Garden City, New York: Doubleday. ISBN 978-0-385-07247-2. OCLC 702840. Gardiner, Robert; Gray, Randal, eds. (1984). Conway's All the World's Fighting Ships: 1906–1921. Annapolis, Maryland: Naval Institute Press. ISBN 978-0-87021-907-8. OCLC 12119866. Garzke, William H.; Dulin, Robert O. (1980). Battleships: Axis and Neutral battleships in World War II. Annapolis, Maryland: Naval Institute Press. ISBN 978-0-87021-101-0. OCLC 12613723. Morison, Samuel Eliot (1948). The Rising Sun in the Pacific; 1931–April 1942. History of United States Naval Operations in World War II. Boston, Massachusetts: Little, Brown and Company. ISBN 978-0-252-06973-4. OCLC 7361008. Noot, Lt. Jurrien S. (1980). "Battlecruiser: Design studies for the Royal Netherlands Navy 1939–40". Warship International. 3: 242–273. Worth, Richard (2002). Fleets of World War II. Cambridge, Massachusetts: Da Capo Press. ISBN 978-0-306-81116-6. OCLC 48806166. Teitler, Prof. Dr. G (1984). De strijd om de slagkruisers, 1938–1940 (in Dutch). Dieren: Bataafsche Leeuw. ISBN 978-90-6707-028-7. OCLC 14691631. This page was last edited on 18 April 2019, at 04:41 (UTC).